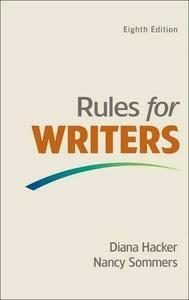 Rules for Writers, now in its 8th edition offers practical and reliable advice to effective writing. Advice is offered on topics such as; composing and revising, writing arguments, analysing texts, using grammar and punctuation correctly, and working with sources. It is packed with exercises which provide excellent writing practice for students and lecturers can also benefit, saving time and effort by drawing from Rules for Writers for planning class discussions, conducting in-class workshops, and providing feedback on student work that they can easily apply. * An emphasis on critical reading – The handbook teaches students a reading process, helping them to analyse various types of texts, sources they discover through research, their own writing, and the work of their peers. * Support for analysing multimodal texts – A new chapter about reading and writing about multimodal texts introduces new genres and practical strategies for analysis. * More help for composing in a variety of genres – Writing guides throughout Rules for Writers help students work through college assignments in a variety of genres. * Practical advice for public speaking – A new section helps students develop effective oral communication strategies, whether they’re writing a speech from scratch or turning a paper into a presentation. * More help with peer review and revising with comments – A new section helps students effectively comment on assignments and apply feedback to revisions of their own work. * Research and documentation support for every course – Substantially revised sections teach students to find an entry point in a debate and develop authority as a researcher.